Peppa Pig is back! Get ready to join in on two new adventures starring the beloved, award-winning U.K. sensation. 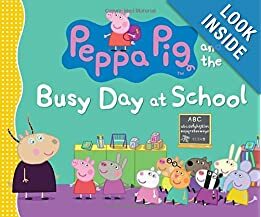 Peppa is having a busy day at school — learning numbers and letters, painting, making music, and playing outside. Peppa can’t wait for Special Talent time, but her excitement turns to worry when all three of her special talents are chosen by others! Luckily, Peppa can revert to her true specialty: jumping in muddy puddles! In this story, the authors brought to our attention the fact that each child has a gift to share with the world. Peppa had many talents but when others in her classroom showed the same talents she became discouraged. She felt she could not find another talent to share with her classmates. However her very wise teacher helped her discover her other talents. Our children are bombarded with lots of media which shows the talents of other people. What we need to help our children recognize is the gifts and talents they already have within them. This book could easily become a springboard for a discussion with your child about her talents. We need to recognize them and celebrate them. DVD Review - Slugterra: Slug Power! Young Scientists Club Kits Make Science Fun! Game Review - Hedbanz Act Up! The Snugg Keeps Your Kindle Safe! Mary Poppins 50th Anniversary Trailer Now Online! Bendastix Lets Kids Create Amazing Things! Bubble Science With Clifford Makes Science Fun! Oxy Helps You Get Back To School! Text-UR Foam Brings All Senses Into Play!